“Buy My Own Drinks” is the lead single from the red-hot group’s self-titled debut EP (9/7) and is written by the trio with celebrated songsmiths Hillary Lindsey and Josh Kear. The song has been lauded a “runaway hit,” (Music Row Magazine) and is making its ascent at Country radio. 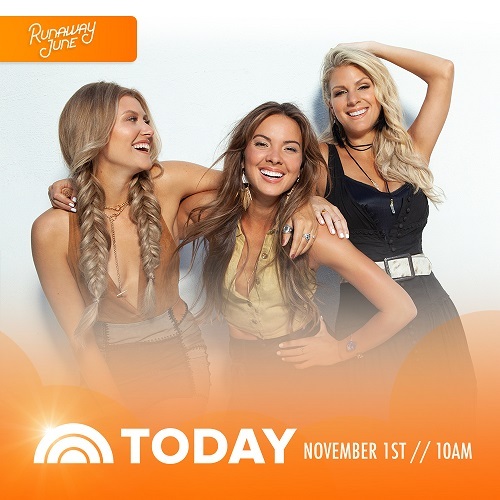 Runaway June continues to take Country music by storm as they prepare to support seven-time Grammy winner and Pollstar’s three-time top female country touring artist Carrie Underwood as she launches a new arena tour, The Cry Pretty Tour 360, in Spring 2019. Sponsored by CALIA, the new tour will kick off on May 1 in Greensboro, NC, and will play 55 arenas across the U.S. and Canada and be promoted by AEG Presents.